Medical electrical equipment is not subject to the standard PAT testing procedures outlined in the IET Code of Practice and should not be PAT tested. 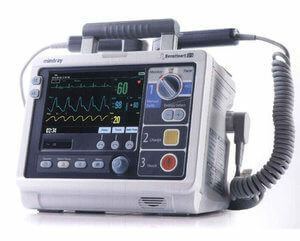 Instead medical equipment should be tested separately in accordance with IEC 62353. IEC 62353 defines it's own series of tests. Some of these are similar to the standard PAT, such as the earth continuity and insulation tests, albeit with their own pass/fail limits. Other test procedures include measuring the leakage current on parts of the equipment connected directly to the patient. This requires test instruments that can measure leakage currents below 0.01mA as well as specialist knowledge to identify the type of applied connectors. As well as hospitals, medical electrical equipment is also likely to be found in GP surgeries, health clinics, dentist etc., so it’s important that you can identify this equipment. 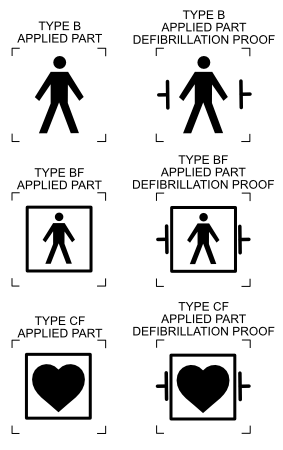 All medical equipment that has patient applied parts is identifiable by a B,BF,or CF symbol. Any equipment bearing these marks should not be PAT tested. Rigel Medical have a practical guide to medical testing. Rigel are part of the Seaward Group and manufacture test equipment for the biomed industry.